Save time and money keeping your educational facility clean with a UniFirst Facility Services Program. With a UniFirst Facility Service Program, school facility managers don't have to worry about managing and restocking their facility cleaning supplies and restroom products. We help you choose the cleaning products you need to keep your facility looking and functioning its best. Then, on a regular schedule, we’ll visit your institution to pick up all your soiled floor mats, mops, and wiping products, and replace them with fresh, professionally clean ones. We’ll also restock your restroom supplies with hand soaps, sanitizers, paper towels, sanitary tissues, and air fresheners. 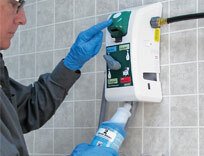 Soap and sanitizer dispensers are included, and we perform ongoing maintenance to keep everything running smoothly. UniFirst offers a variety of environmentally friendly cleaning products, including PVC-free floor mats, water-saving microfiber mops, biodegradable hand soaps, and recycled paper items. When included as part of a fully managed Service Program, your school facility management program can earn Leadership in Energy and Environmental Design (LEED) points and help you qualify for environmental certification by the U.S. Green Building Council (USGBC). Compared to buying school cleaning supplies at retail and stocking them yourself, UniFirst Facility Service programs deliver high quality commercial products as you need them, lowering your storage and maintenance costs, and guaranteeing ongoing, reliable, consistent product availability. Our convenient wall mount dispenser system mixes concentrates and dispenses ready-to-use cleaning solutions at the push of a button. For dramatic savings in school cleaning products, use our eco-friendly concentrates and automatic dilution control and dispensing system. When you purchase ready-to-use cleaning supplies, you’re paying for 95% water and elaborate packaging. And when you “free pour” concentrates to mix your own cleaning solutions, it’s like pouring money down the drain, because you often use more than is needed. With UniFirst Cleaning Solution Dispensing Services, you get reliable delivery of your concentrated refill cartridges when you need them, and perfectly diluted cleaning solutions, every time, at the simple touch of a button. See the UniFirst Facility Service Programs Catalog for our complete line of green cleaning facility services and products. Start UniFirst Facility Services for Schools today. Call (800) 455-7654. Browse our online catalog and choose from green cleaning supplies and facility service products. Conveniently customize a facility service program quote for your facility.